Looking W from top of demolition rubble mound at N front of cottage, including front half of ‘woodstore’. 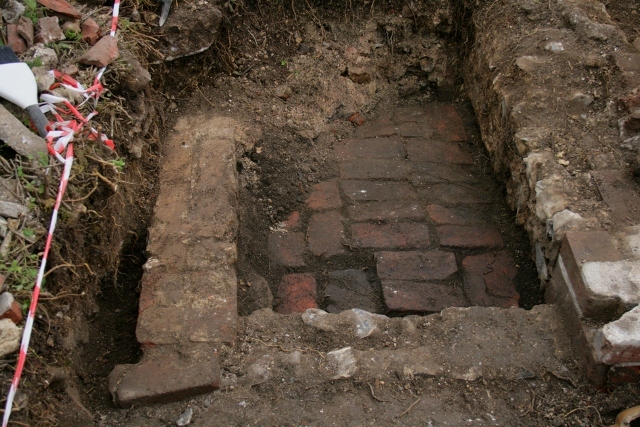 We continued excavating the small woodstore, or “cubby-hole” as a former tenant described it, on the east side of the gable frontage of the cottage. 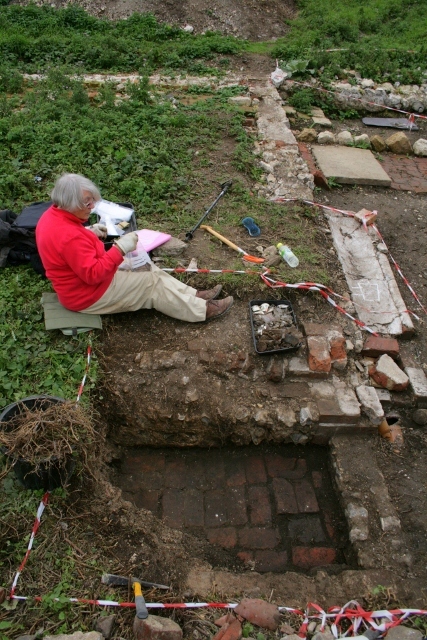 And, at the bottom of its 0.5m deep fill of demolition rubble, we came across a ‘shed load’ of finds! Looking S at ‘woodstore’ against E side of cottage’s N frontage. Looking W at ‘woodstore’ against E side of cottage’s N frontage. It was only about 1m wide and a more or less accurate plan (from papers dated 1922) indicated it may be about 2m long. So we have so far excavated about 2/3 of it, and it is a real gem! 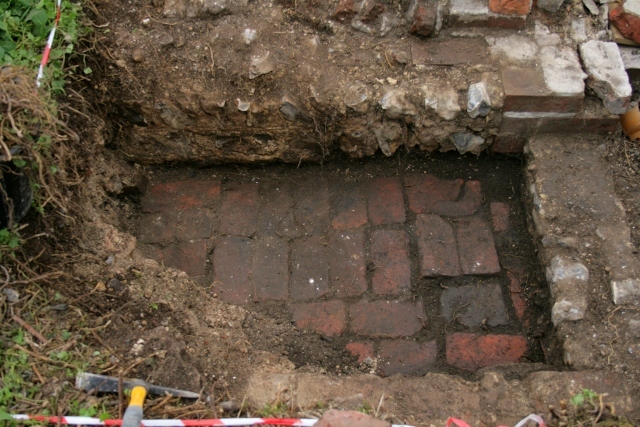 Just inside the threshold we found a compacted earth floor, but further digging revealed that this lensed out to reveal a brick paved floor underneath. Immediately under the earth surface was a large quantity of coal and some charcoal. Was this ‘in situ’ charcoal evidence for the cottage having been burnt down during its WW2 destruction by allied exercises after the last tenants were forced to leave in October 1942? The evidence is that this is unlikely. The coal was unburnt, a fragment of unburnt wood was excavated early in the dig from inside the house under a layer of collapsed masonry, and no in-situ masonry has as yet shown any signs of fire scorching. Nevertheless, occasional fire burnt flints, charcoal and other burnt material has been excavated across the front of the site, but they were isolated finds – perhaps from bonfires, fire ash from the cottage’s hearth, and extreme heat from military ordnance. 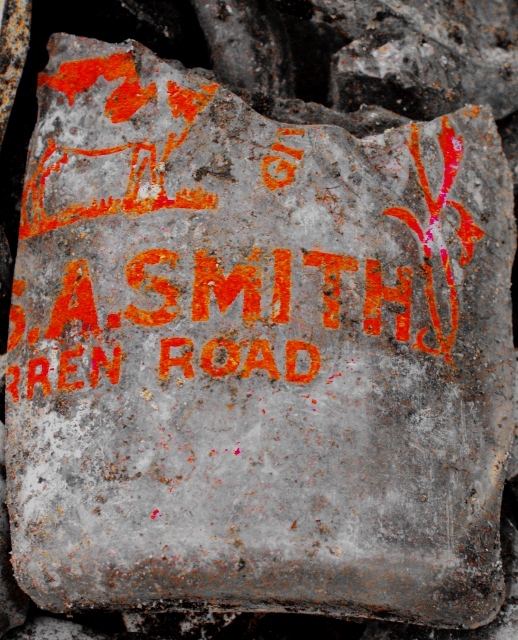 Enhanced image of Smith’s Woodingdean Dairy milk bottle. The finds included a large quantity of milk bottle shards – mostly from the nearby Woodingdean dairy, which dated from the early 1920’s when it was called the Warren Farm Dairy Farm, run by the West family who also ran Bevendean Farm, then, in the 1930’s(?) as Woodingdean’s population grew, a Mr Smith was able to turn the delivery of the milk into a separate business, which he ran until the end of the war. They are easily identified by their red painted writing/design, and have especially turned up right across the area in front of the cottage in large numbers. It is interesting to see the name changes recorded on our bottles shards. Woodingdean author Peter Mercer has recorded local people’s memories of the dairy – but its full story has yet to be told. 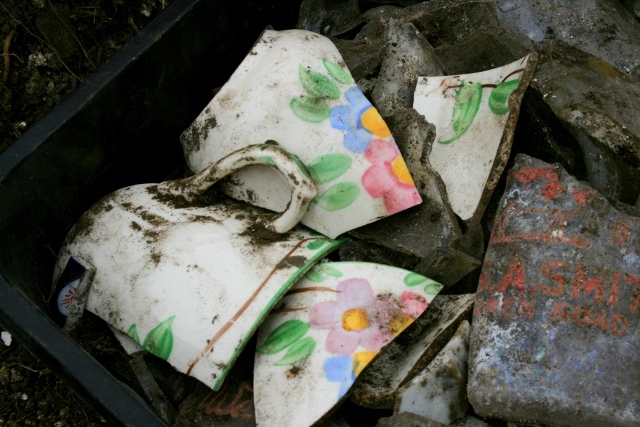 Porcelain cup shards with colourful flower design and intact handle. 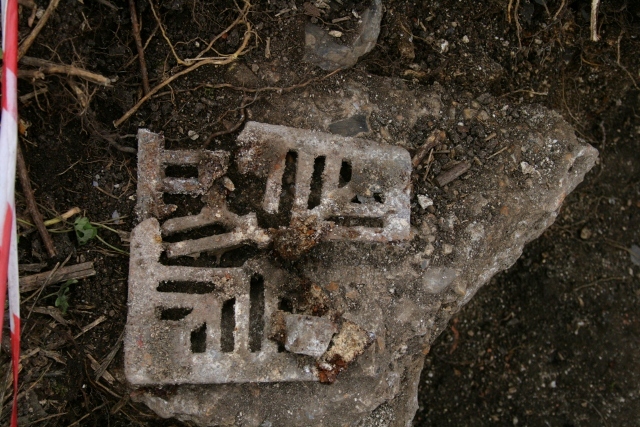 No military ordnance was found, nor were any shards of ‘blue and white’ willow pattern ceramics. We can’t remember a grid square without either them for a long time! However, some very nice ceramic finds included most of a porcelain cup with a brightly coloured floral design – and with its handle intact – a first for the dig. Fragmented cast iron grating, probably for our gully drain. Part of a cast iron coal grate? 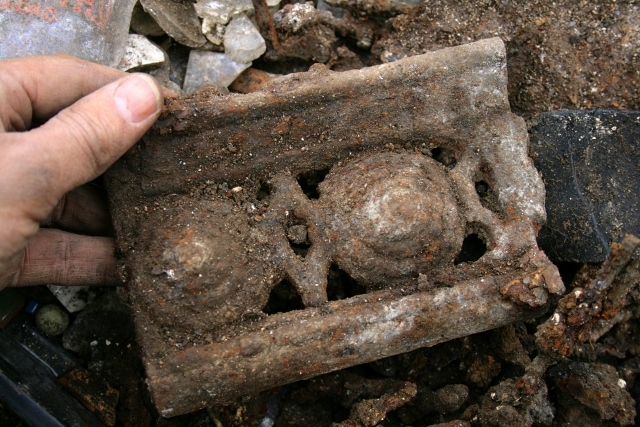 The other is possibly a large part of a nicely moulded grate to a coal fire. This could be a very important find *if* it is part of a coal fire grate and can be dated to when the cottage was built in about 1830. Unlike a wood fire, a coal fire requires air from underneath to keep it going, which is enabled by a grate. There was very little wood over this part of the downs so imported coal was likely to have been cheaper than wood as a fuel source. It was certainly brought by ship to Brighton during the 19th century. 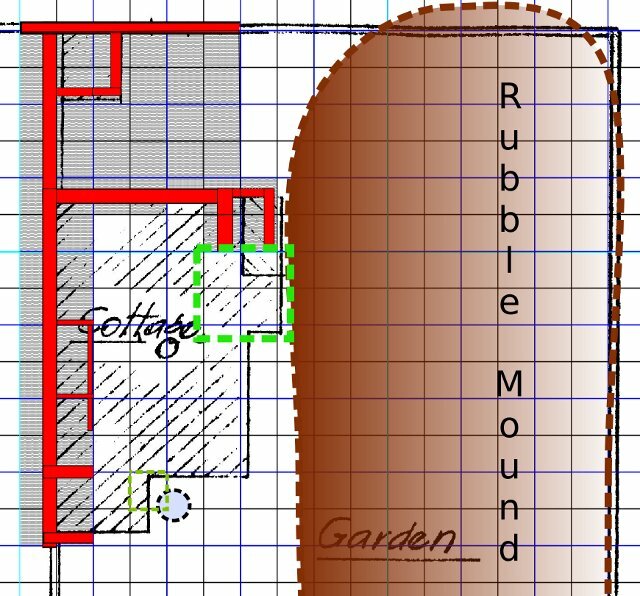 Plan of dig site progress with wall lines in red and next area to be dug in green, on top of an old plan of the farm from East Sussex Record Office. What will the far end of the woodstore contain? And is the structure shown on the 1921 (or earlier) plan beyond it a cupboard, a fireplace, or even a backdoor? Only further digging will tell. We would love you to join us – no experience required! We meet at the car park near the junction of Bexhill Road and Falmer Road, just north of Woodingdean, at 10am, and if the weather is too bad to dig we are still happy to give a quick tour for anyone interested. Also, we now have a date for our official guided tour of the site; it will be on Saturday 2nd November,at the same time and place as above.